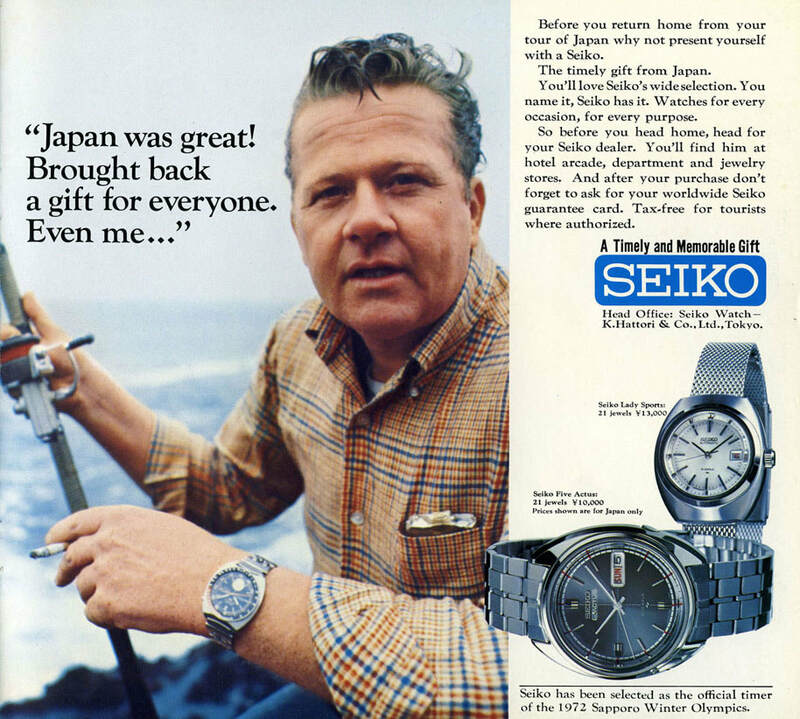 Finally, a credible & affordable vintage market for Seiko. Whenever anyone has ever asked me, Adam, I don't have a ton of money to spend but I'd like a quality watch. I've always answered Seiko and likely always will. Seiko, aside from it's structure and pricing, is much like a Rolex. Seiko does all R&D, manufacturing, case making, and even makes their own oils in their mechanical watches. In recent years Seiko has established itself as a leading luxury brand once again with the higher end models and even significant craftsmanship on their less expensive mechanical pieces. With their endless designs, quality and colors, it does not surprise me that vintage mechanical Seiko watches are now highly collectable and in high demand. We present to you our best findings. Enjoy. I think I said enough in the product name. This Seiko Bell-Matic is a collectors dream come true. If you do not have one of these wonderful bell (not cricket) sounding pieces in your vintage Seiko collection, you have to; and this is a great piece to pick up. It's a complete original package with inner and outer boxes, booklets, tag, original bracelet, crowns and crystal. Two extra links are included for the bracelet and should fit up to an 8" wrist. The all stainless steel Bell-Matic 17 Jewels Automatic Alarm Watch 4006-6027, Japan Movement, has been serviced and running very well. We kept the original crystal on the watch; however, there is significant scratching on the crystal. We will keep things original; however, we've added an option to have it replaced if you wish. Thank you. An incredible addition to the Seiko vintage line of watches; this high-grade column wheel chronograph has just been completely overhauled, while keeping every component original to the watch. The watch keep excellent time, very close to chronometer specs. The dial has not been refinished and is almost perfect. All functions work properly. The watch is made very well with full stainless steel case and solid original bracelet. This watch will comfortably fit a 7.5" wrist using it's original bracelet. The watch does not have a seconds hand. The main seconds hand is part of the chronograph with a 30/60 min counter below and a 12 hour counter on the top subdial. The dial is absolutely stunning. Dubbed the "UFO" watch by collectors, this watch won't disappoint even the collector that collects only Swiss watches. The Seiko competes at a high level just as they do now with their high end line of sports watches. As soon as I saw this watch I knew, I've got to have it in my new slowly growing Vintage Seiko inventory. This is a very unusual beast and it always amazes me how they cram so much mechanics into a case to include a mechanical alarm. Seiko Bell-Matic, 17 jeweled automatic. I particularly like how they designed the red alarm display on the dial. It has a much more rugged look than a Memovox. It really does use a little hammer to bang away when it goes off. Fabulous retro styling and excellent condition with this used Seiko very collectible and a top investment. The main crown is used to wind up the alarm when in its neutral position whilst the running of the watch is the automatic movement only. The crown also adjusts the alarm setting ring on its first click and the obvious setting of the time on the second click. The alarm is switched on and off by the top button and when this is depressed in, it is also used to set the date when pushed in. The Dial is so 1970s retro in blue dial with a day/date window at 3 o clock. The case is in stainless steel. What we love about this watch the most, is the bracelet - it has a very, dare I say, Gerald Genta look. This is one of the nicest Seiko model ever made and certainly a quality watch. It screams the 1970s and has a fabulous automatic movement but you would have to be a wealthy man back then to buy one. Truly a Seiko classic with a huge retro appeal. I fell in love with this dial the moment I looked at it. The is a private label watch from Montgomery Ward, a retailer that is still in business today and was one of the first large American Retailers opening up after the civil war. This dive watch, of course, is not from that period and is from the 1950's. The piece is all original except for a vintage black leather replacement strap. There is brassing on the front of the original crown; however, there is no notable brassing otherwise. The watch features a black bi-directional rotating bezel, stainless steel case back, day/date complication, and a very efficient and reliable UT-38 automatic 17 jeweled movement. This movement "UT" Universal Time Corp., was established by Seiko which built in-house movements for branded retailers watches; assembly and casing were done in the USA making this watch an American brand. Just serviced and ready to wear or collect. You don't see these around very often. But what truly gives value to this watch is an outstanding original dial in excellent condition with awesome patina. This highly collectable Japan movement vintage Seiko is 39mm in width, recently serviced and keep good time. The original black dial is very attractive with no notable flaws. The original bracelet has all its links and is in excellent condition. This watch has not been polished. Thank you. This rare vintage 1970's Seiko is quite a gem to find. The dial is stunning with a deep aqua blue color and even cream patina on the inner rim and indices. The most fascinating feature of this vintage Seiko is its original faceted glass crystal. It draws one's eyes to gaze at the dial. This is a 25 jeweled automatic in-house Seiko movement made in Japan. The watch is all original, in great working order and is presented on a simple black waterproof new vintage old stock strap and silver tone tang buckle. A Seiko purists dream, this rare 6138 "Helmet Lugs" Chronograph Represents an important milestone in horology. The Seiko 6139 and 6138 series are the first fully integrated automatic chronograph in the world featuring column wheel and vertical coupling mechanism. With this movement, they have set the standard which was followed by the Swiss watch industries 20 years later. The same movement configuration was adopted by Rolex when it made its own in-house movement for Daytona in the year 2000, 30 years after Seiko released the caliber 6139 and 6138. The 6138 was the successor of the 6139 automatic chronograph movement but produced in parallel until 1979. The 6138 was technically at least equal to his Swiss counterparts as it had a fully integrated chronograph. There were two versions of the 6138, the 6138A introduced in 1970 had 21 jewels. The 6138B was introduced a bit later with 23 jewels. Both feature a column wheel that regulates the chronograph functions; and a vertical clutch mechanism for the engagement. It is still considered to be superior over the mechanically more simple Cam Actuated movements. The movement diameter measures 27.4mm and a height of 7.9mm. The "speed" is 21.600 a/H. This watch is completely original except the replacement strap which is a new high-grade Hadley Roma dark brown strap featuring medium padding, genuine leather and a square cut alligator design with a stainless steel buckle. Please note that this watch has many surface scratches on the original glass crystal. They are not too noticeable in indoor and shaded lighting; they are all surface scratches so they become presentable with sunlight and glare. The side photographs should give you a good idea of what I mean. Since the crystal isn't compromised nor has any large chips, cracks or large scratches, we've decided to keep it on and leave is original. If the purchaser would like a new crystal installed, we will do so free of charge upon purchase with a Seiko replacement - you just need to let us know in the checkout notes, contact page or call - this will add approximately 5-7 days to shipping if you choose a new crystal. This watch is recently serviced and is working well. Thank You! This is a fantastic example of the Seiko chronograph 6139-7080. The case is very nicely designed and shaped, very comfortable on the wrist. The original bracelet is in great shape with all its links. The watch is a seconds and 30min chrono. It works as normal two button chronograph and everything resets to zero as it should - this watch has been recently serviced and working well and keeping good time. This vintage Seiko also features a cool date complication. The blue original dial is awesome and near flawless. Ready to wear or collect, this is a hard one to find.